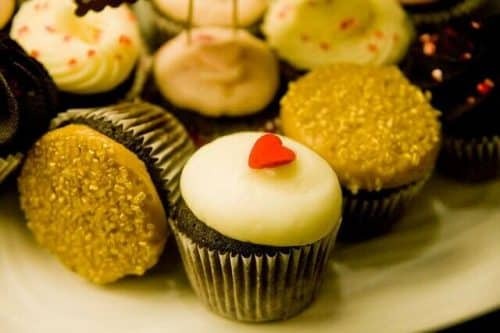 The best way to surprise your Valentine is with some semi-homemade cupcakes. Of course, you are busy and you probably don’t have time to make cupcakes from scratch. At the same time, you want to do something special and heartfelt for your Valentine. The best solution is to make some cupcakes from the box, but use special cupcake decorations to surprise that special someone. Brew some coffee before they come home to make the surprise complete. Preheat the oven and follow the directions on the box of your cake mix. After you’ve finished baking your cupcakes, let them cool for about an hour to an hour and a half. Spoon some frosting into a bowl and mix in a drop or two of red food coloring. This is optional. If you want to have white frosting you can hold off on the food coloring. Evenly frost the top of all the cupcakes. Be creative! Use red candy hearts and sprinkles to decorate the cupcakes. You could use the red candy hearts to spell out your Valentine’s name. Use one letter per cupcake. You could also just make different designs on each of the cupcakes or keep it simple and just top each one with one heart! when your Valentine arrives. Happy Valentine’s Day!